Air Force photograph by Joseph M. Juarez Jr. The ninth Wideband Global SATCOM (WGS-9), satellite is transported from the Boeing facility in El Segundo to LAX for delivery via an Air Force C-17 Globe Master, to Cape Canaveral Air Force Station, Fla., Jan, 9. WGS-9 will provide additional communications capabilities to both U.S. forces and international partners after undergoing final processing, encapsulation, and transport to the launch pad. 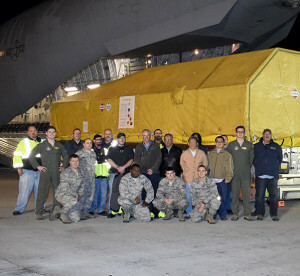 The U.S. Air Force Space and Missile Systems Center-sponsored ninth Wideband Global SATCOM spacecraft arrived today at Titusville-Cocoa Airport, Fla. The shipment of WGS-9 marks an important milestone for the launch campaign. WGS-9 will provide additional communications capabilities to both U.S. forces and international partners. In January 2012, Canada, Denmark, Luxembourg, the Netherlands, and New Zealand signed a multilateral Memorandum of Understanding with the United States, agreeing to fund the procurement of the ninth WGS satellite. The United States is responsible for funding the launch, operation and sustainment of WGS-9. International partners will receive a proportional share of the bandwidth provided by the WGS constellation based on financial contribution. The spacecraft is undergoing final processing, encapsulation, and transport to the launch pad at Cape Canaveral Air Force Station, Fla. The launch is scheduled for March 8. Wideband Global SATCOM provides anytime, anywhere communication for soldiers, sailors, Airmen, Marines, and international partners through broadcast, multicast, and point-to-point connections. WGS is the only military satellite communications system that can support simultaneous X-band and Ka-band communications with crossbanding that makes it transparent to the users to communicate across terminal types. WGS provides real-time data exchange necessary for tactical communications. WGS supports a wide variety of missions for Combatant Commanders around the world to perform missions, from search and rescue efforts to military operations. 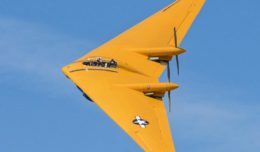 Matching the recently launched WGS-8, WGS-9 also includes the new state-of-the-art wideband digital channelizer that will increase communication capacity for the warfighter by approximately 45 percent compared to the first seven WGS satellites. This increase in capacity will ensure U.S. and international partners have the capability to effectively coordinate on all mission areas, including air, land, and naval warfare. The WGS constellation is the highest-capacity military communications system in the U.S. Department of Defense arsenal. With one more satellite in production, the WGS constellation is expected to have a total of 10 satellites on orbit by 2019. Air Force Space Command’s Space and Missile Systems Center, located at Los Angeles Air Force Base in El Segundo, Calif., is the U.S. Air Force’s center for acquiring and developing military space systems. Its portfolio includes GPS, military satellite communications, defense meteorological satellites, space launch and range systems, satellite control networks, space-based infrared systems, and space situational awareness capabilities.